While Apple often offers a live stream for its special events, the company has confirmed there will be no live stream for the March 27 education-focused event set to take place at Lane Tech High School in Chicago. 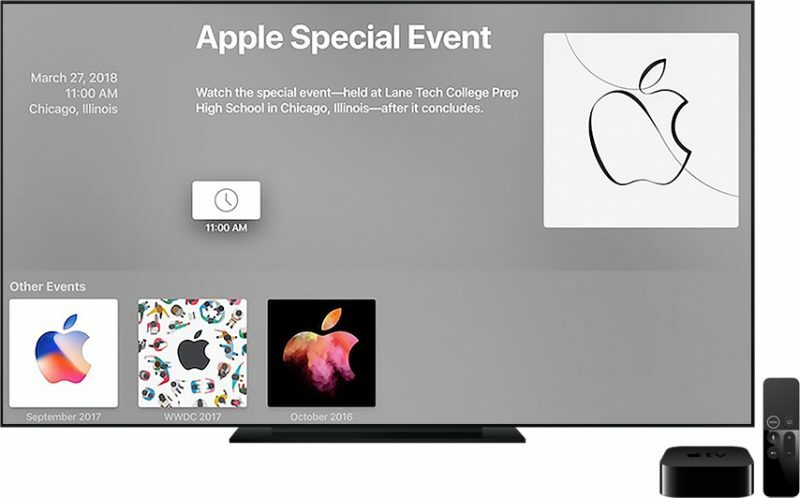 Apple today updated the Events app on the Apple TV to add an image of the invitation for the upcoming event and to note that a video will be uploaded later in the day following the conclusion of the event. Apple has not held an education-focused event since 2012, so we weren't sure what to expect. That event was not streamed either. Given that this is primarily an event for teachers and students rather than regular customers, it isn't a surprise that we'll have no live stream. MacRumors will offer live coverage of the educational event both here on MacRumors.com and on our MacRumorsLive Twitter account, so make sure to visit us on Tuesday if you want to hear about what Apple has in store for schools. Leads me to believe there will be no product announcements. In other news, reactions from disappointed Apple haters WILL be live streamed. Probably the lack of uplink bandwidth on the school's network. No straight to internet path, probably VPN's to the district so it's even more limited. Not worth bringing in dedicated lines just for this event. So I guess no hardware products at all? Announcing new stuff without stream seems unlikely. tbh I expect Apple has much better control, streaming and mixing capabilities in Moscone West, Steve Jobs theater, town hall etc. It just might not be worth it to try and pull off a live stream. Right, because people who are genuinely disappointed must "hate" Apple. :rolleyes: Only people who hate the company expect and desire new products from them. I was looking forward to product announcements. Something exciting. If Apple fails in other aspects, it excels at marketing, and these presentations are usually their “cash in the bank” successes. The fact it isn’t going to be live streamed means there’s nothing to see. May as well move along folks. Didn't Apple announce the 5th gen iPad, red iPhone, and several other products by press release at this time last year? Certainly seems like an event like this could still have some products, alongside a press release after the event. Well, not because of this, but I do believe he’s the wrong man for the job. He’s too cautious with innovation. I genuinely believe he doesn’t see products the way Jobs did. Then again, I’m not sure anyone does. While you definitely make good points, I feel like Apple was at a point with their brand already when Cook took over, that it couldn’t really go anywhere but “up” as long as they didn’t completely screw up. A massive percentage of Apple’s customers these days would buy anything Apple releases because of either brand loyalty or because it’s the “cool” thing to buy. It’s an iconic brand and that’s really difficult to ruin. But if you look deeper than cash, you’ll see things like major oversights with software, declining technology innovation, “safe” moves, etc.. I get the feeling Tim is just too nice to be a truly successful leader. Jobs was a total ******* at times, and that kept people in line. I don’t feel Cook is ruining Apple, but I do feel they’d be in a different place if he wasn’t CEO. I think you make very valid points as well and I don’t disagree with what you’ve said. Tim Cook is no Steve Jobs but I think comparing the two is unfair to Cook at this point in his tenure. Steve Jobs was one of a kind. The other important point I think is that Steve Jobs happened to be in the right place at the right time three times in his life while a computing paradigm shift was under way. If you’re not in a place and at a time where a paradigm shift is coming then you don’t have the chance to do something revolutionary. How often is there a major computing paradigm shift? Jobs was there during the time when PCs, GUIs and laptops were emerging. Had Steve Jobs not been around we’d still have PCs, GUI’s and laptops. They may not be as good as they are today but they’d be around. The same goes for the iPod. I owned an MP3 player prior to buying an iPod. Apple figured out how to make a better digital music player than anything else on the market and was able to create a digital store that integrated perfectly with the device. Finally getting the music industry to willingly remove DRM was a master stroke but I think that technology was always going to come from somewhere. It just wasn’t going to be as good. Look at the iPhone and the iPad as well. Apple wasn’t the first company to produce a smart phone that could play music or a tablet. They were visionary in that they saw that no consumer wanted to carry both a cell phone and a digital music player so they wisely jumped into the smart phone market and revolutionized it with multi touch technology and an App Store and used that same technology to tackle tablet based computing. The paradigm shift from a desktop or laptop as a consumers primary computing device to a smart phone or tablet was coming, but again, Apple figured out how to do it better than the competition. I don’t know where the next paradigm shift will come from. My guess is that it will be in the form of some combination of an AI that “follows” you regardless of which device you are using (or driving in the case of self driving cars) combined with AR and wearables. Apple and its competitors are playing in all of these spaces right now. Cook and Apple, like Jobs and Apple before him, are in the right place at the right time now. Only time will tell if they can seize the moment and produce something revolutionary as they so often did under Jobs. I, like you, have my doubts but I don’t think it’s fair to throw Cook under the bus just yet. Let’s see what Apple can do with these new emerging technologies that appear to signal another computing paradigm shift.